Published: 07:43 Friday - June 29, 2012 Visiting Van Phuc today, we feel the asmothphere of a handicraft village on the way to develop, hear the familiar clatter of shuttle driving melody, see villagers spinning under moonlight. 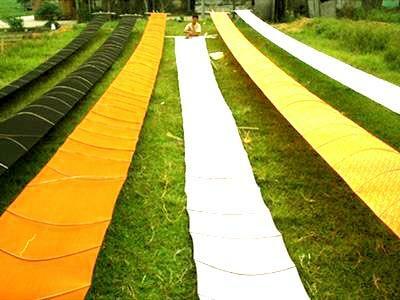 Products of Van Phuc has a typical traditional value which is considered as symbol of traditional beauty. Located on the bank of Nhue River, 10km from southwest of Hanoi Old Quarter, Van Phuc village is renowned for its traditional weaving and premium quality silk products. At the age of over 1,200 years, Van Phuc is proud to be the most ancient silk village which provides the best silk in Vietnam. Visitors in Vietnam tours visit Van Phuc village will be impressed by typical manner of an ancient village in the north of Vietnam with banyan tree, well, communal house, and the sound of power-looms everywhere. 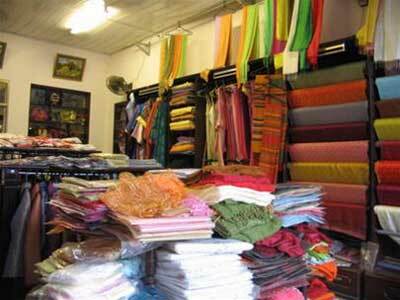 Walking on the main road in Van Phuc, tourists will be lost in the world of silk with various products like shirts, ties, crafts, dresses… made of silk available in the village. For a long period of time, silk was considered as extremely precious handwork which was only used to tailor Royal members' and aristocrats’ dress. 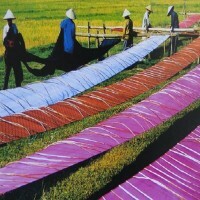 The special beauty of Van Phuc or Ha Dong silk was inspiration for many Vietnamese poems, songs and movies (see The White Silk Dress, one of the 5 most outstanding Vietnamese movies). Van Phuc silk has been known for its smooth, light weight, and elegant appearance. Especially, a traditional kind of silk called Van Silk made in Van Phuc make the wearers feel cool in summer and warm in winter. Today, to satisfy various demand for silk of the market, Van Phuc silk producers have expanded their silk and garment goods like embroidered silk, , wrinkled silk, double layers and more colors for silk products. Many families in Van Phuc open their own shops on the main road of the village; create a “town of silk” that sell eye-catching and high quality silk products. Tourists in Vietnam tours may buy available nice souvenir and clothes in the shop, or select the most suitable materials to then get customized products. The sellers are very friendly and can speak a little English and French to communicate to foreign tourists. Today, although the weaving has been mechanized for higher productivity, but there are still simple manual looms in some houses in the village which help visitors contemplate the genuinely traditional Vietnamese way of making silk.